The original club website was created in November 2003. The founding webmaster is currently in the process of replacing the Netherlee site with a personal scottish country dance journal. The journal will continue to provide the same services and information as the original site. It will, for the foreseeable future, retain the original domain name ‘netherleescdclub.com’. This site will be subject to continuous change over the next few months until it reaches a state of stable equilibrium!The webmaster hopes the website continues to be of interest and indeed useful for the not inconsiderable number of folk who regularly visit the site in the past (see ‘Hits Count’ in the main menu). Fairfield House Hotel is part of a Victorian Mansion in Ayr, Scotland. It is a 10-minute walk from Ayr railway station, 2.6 miles from the Robert Burns Birthplace Museum and 7.9 miles from Royal Troon Golf Club. (Thursday 26th to Friday 27th October. 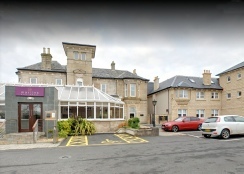 The outing in 2018 was again to Fairfield House Hotel, 12 Fairfield Road, Ayr. It was a bittersweet gathering as it was the final Away Weekend of the Netherlee Scottish Country Dance Club. The accommodation was first class. Elizabeth and Iain prepared the dance programme and shared the calling on the night. We danced Thursday evening, Friday morning and Friday evening, returning home Saturday. Several of those attending expressed a wish to meet again, perhaps just to meet for coffee or dinner or even arrange a night which might include a dance programme.